Here is a link to the Marketscaping presentation from the Texas APA conference in October, 2013. "Marketscaping: Promoting the Local Economy, Sustainability, and the Creative Class"
I also presented another session on Enabling Cutting Edge Sustainability. I will be presenting, "“Marketscaping”: Promoting the Local Economy, Sustainability, and the Creative Class with Farmers and Artisan Markets" at the Texas APA conference in Galveston, Texas, October 3-4, 2013. Amanda Vanhoozier from the City of Coppell will be assisting me with this presentation. 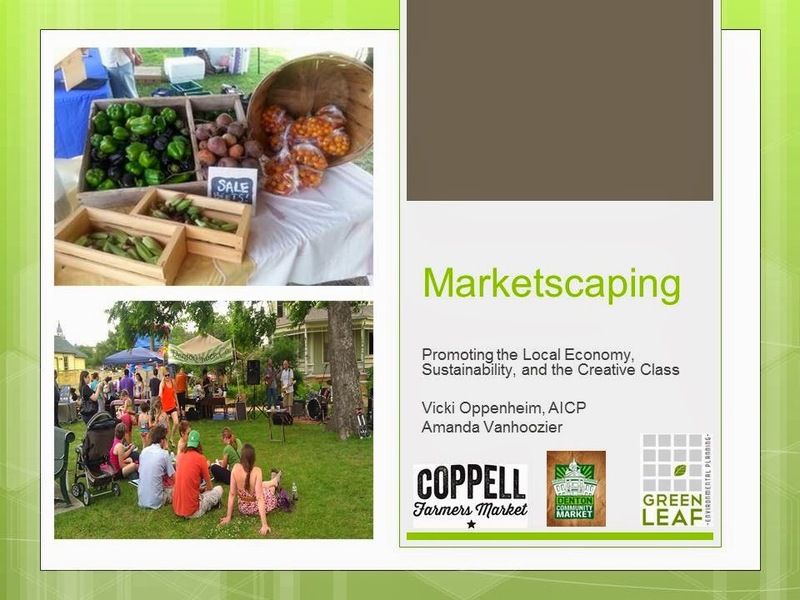 The Denton Community Market and the Coppell Farmers Market will be featured as examples of Marketscaping, with positive economic, development, and community impacts. "Marketscaping" is a new term coined by Green Leaf Environmental Planning for the process of utilizing farmers' and artisans' markets as a tool for downtown revitalization. •Markets may be in temporary or permanent locations in the downtown to create a sense of place, activate the creative class, and catalyze the local economy.